Looking for a quick on-the-run breakfast or snack for your children… or even yourself? If so, you need to check out Happy Squeeze Greek Yogurt. 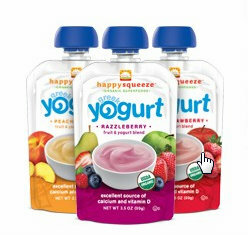 No fuss, no bother, and no spoon required, this fast and easy pouch contains a fantastic source of calcium and Vitamin D.
The Happy Squeeze flavors are Peachy Keen, Razzleberry, and Super Strawberry. They are all gluten-free, and make sure you check out the allergen chart for all of Happy Family Brand products. In a nutshell, Happy Family Brands is a company that you can feel happy about. And for that reason, they have been awarded this week’s Friday Favorite on BeFreeForMe.com! Congrats! It’s not very often that I love, love, love a product. The kind of love that I want to sing my praises from the highest rooftop. A product that has ingredients, packaging, ease of prep, and most important, a taste that I love. And Vigilant Eats Organic Superfood Cereal has it all. This organic cereal is also (certified) gluten-free, soy-free, dairy-free, and has no additives, preservatives or refined sugar. It is also Non-GMO certified, and is vegan certified too. The cereal comes ready-to-eat in a cardboard cup. The prep is easy too. Just add a little bit of cold water (no boiling required!) and mix with the portable spoon that is included in the package. And Voila! Breakfast is served! A hefty portion at 3-ounces, this gluten-free cereal is filling and delicious. My favorite variety is the Coconut Maple Vanilla – and no wonder since coconut, maple and vanilla rank up there when it comes to three of my favorite foods (and scents!). Other delicious flavors are Goji Cacao, Espresso Maca Mulberry, and Maca Double Chocolate. A congratulatory shout-out from the highest rooftop to Vigilant Eats on being awarded this week’s Friday Favorite on BeFreeForMe.com!